Computer programming – or better said writing code is a beautiful art form in my eyes. I’ve been an artist since pre-school and I continue to embrace all types of painting, photography, collage, papier mache, sculpture, and writing to create my art. I’m a huge sci-fi freak who loves the unknown of space exploring, planets, robots, and this mystery is showcased in much of my art. My acrylic paintings display my love of modern/pop combined with science, Seattle architecture, math, high tech, English slang, and of course my personal outlook applied to the subject at hand. Each painting name can be part of the art. You can call me a girl geek and I’m proud to be one as I have lived a double life working as a daytime professional geek and coming home to my studio turning myself into a nerdy artist. My recent art projects have uncovered my deep passion to utilize recycled computer parts, along with odd objects discovered in thrift stores. I transform them into a vivid story on canvas or a sculpture piece. 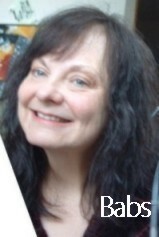 ﻿Babs grew up in Spokane Washington and escaped to Seattle, WA in the late 1980’s. She studied pre-architecture, and fine art at Washington State University and has a AA degree in computer programming. She has worked as a business analyst for companies like General Electric, Zones, Washington State, and Boeing. She showcases her art pieces all over Seattle at locations including Populuxe Brewing, Peloton Café, OK Hotel, The Mecca Café, the Bemis building and so many more including Seattle neighborhood art walk nights. Babs is a continuing participant in the annual Gigantic Bicycle Festival and INKY Spokes has shown her art at the Centennial Fields Park in Snoqualmie, WA, The Vera Project in The Seattle Center and the Tacoma Art Museum. In 2017 Babs was a participant in "Art Rising" - an Interactive arts event held on John Street in South Lake Union, Seattle. She had a booth showcasing her art project called, “VERTICALITY” which was a juxtaposition of South Lake Union Change. The story Verticality voiced was to embrace change but never forget the past and how the South Lake Union area once looked. She had historical before and after photos of the South Lake Union neighborhood displayed and set up a photo booth with a building backdrop for visitors to pose with. Interaction with visitors was key to capture stories and memories. In 2015 Babs short film she wrote and directed called “TECHAVENTION” took first place at the Cine City: A Community Film Expose film feastiible held at Naked City Brewery. In 2011 Babs was one of the 24 artists who did the 24-hour nonstop create art marathon for The Center on Contemporary Art - aka CoCA. Babs B/W photograph titled Goodbye taken at the Vietnam Wall in Washington DC - took first place in a Washington State employee art contest in 2004. Copyright 2019 Babs Fulton. All rights reserved.